The average price for this game in the past 6 months is $4.76. The game first became 50% off on Dec 12, 2012 at Green Man Gaming. Lowest historic price was $3.75 on Dec 24, 2014 at Green Man Gaming. Batman Arkham City and all it's DLCs chopped to a mere $3.75 over the weekend after coupon at GMG. Ties its lowest price ever and 81% off the usual $19.99. T'was the last big Batman video game where Mark Hamill voiced the Joker. Arkham City Game of the Year Edition drops to $5 after a 75% off instant savings sale at Green Man Gaming. Too bad Mark Hamill's not the voice of Joker in Batman Arkham Origins... it make Arkham City look that much better. Now the PC download is only $5.62 after coupon at GMG. Normally sells for $30. How is it $6? It only gives a $7 saving. The average price for this game in the past 6 months is $4.68. The game first became 50% off on Nov 28, 2013 at Amazon. Lowest historic price was $3.75 on Dec 24, 2014 at Green Man Gaming. Arkham Knights re-release didn't go so hot last week with customers, but hey the older games are dirt cheap this week at GamersGate. Arkham Origins on PC is only five bucks (about $1 off its all time low). A rare 75% price beak. Batman Arkham Origins once again back to $5 at GamersGate in their Warner Bros. Sale. Rare 75% off the well reviewed 2013 game. Take 75% off Batman Arkham series PC games this weekend at GamesRepublic. Arkham Origins is down to $4.99, best price seen in over a month. Better than the Steam Summer Sale, is the Batman Arkham series at GMG. Not only do they match the 75% instant discount, but there's also a stacking 25% off coupon code cutting the game to only $3.75. Ties its all time low. Batman: Arkham Origins hits the $5 mark today in GamersGate's Holiday Sale. It's one among many Warner Bros. Titles on sale with a hefty 75% discount. Hot price on this Batman Arkham Pack netting you everything in the series except Origins. Arkham Asylum GOTY, Arkham City GOTY, Arkham Knight and Season Pass for $10. The average price for this game since released is $18.29. The game first became 50% off on May 22, 2014 at Amazon. Lowest historic price was $8.99 on Dec 26, 2016 at Fanatical. This Batman Arkham Bundle at Bundle Stars is smoking hot if you haven't bought into the series yet. 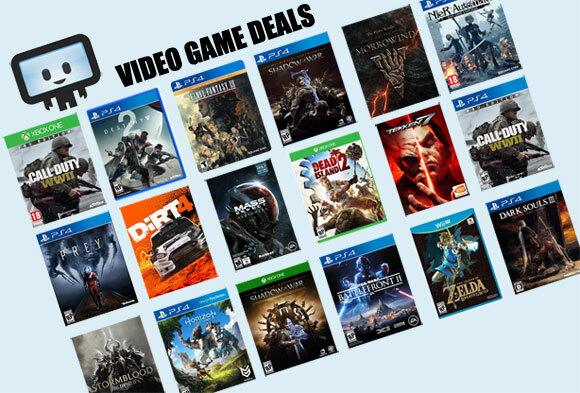 Includes Batman Arkham Asylem GOTY, Arkham City GOTY, Arkham Origins, Arkham Origins Season Pass all for $9 after coupon. Separately at normal prices you'd pay $108, but even all these items on Steam right now during the Winter Sale you'd pay $25 vs. the $9 in this bundle. If you still don't have any of the Batman Arkham, now is the best time to pick up this bundle. Buying separately at their lowest prices you're looking at $20. The average price for this game in the past 6 months is $4.71. The game first became 50% off on Oct 22, 2010 at . Lowest historic price was $3.29 on Aug 1, 2016 at GamesPlanet. In addition to the Batman: Arkham Knight, GMG also has the older Arkham series games on sale like Batman Arkham Asylum Game of the Year Edition. At $3.85 after coupon it's only pennies off its all time low and 81% off the usual $19.99 list price. Yeah this is the GFWL version I believe - thanks for letting us know. Never played Batman Arkham Aslyum before? GOTY edition is now only $5 from GameStop. Last spotted at $7.50 a month ago. The average price for this game in the past 6 months is $5.00. The game first became 50% off on Jan 27, 2017 at Monoprice. Lowest historic price was $5 on Nov 14, 2018 at Microsoft. New low on the remastered version of Batman: Return to Arkham is down to $15 on Xbox One. It’s worth a pickup if you’re a fan of the game looking to relive some pretty epic moments. The average price for this game in the past 6 months is $4.99. The game first became 50% off on Apr 14, 2014 at Green Man Gaming. Lowest historic price was $3.75 on Dec 24, 2014 at Green Man Gaming. Batman Arkham Origins Blackgate - Deluxe Edition released only 2 weeks ago on PC, and it's already 60% off in GMG's 7 Days of Deals sale. Lowest price ever by $9. Batman Arkham Origins Blackgate has been out for the PS Vita and Nintendo 3DS since October 2013, but just yesterday it released for PC. Green Man Gaming's 20% off coupon code slashes $4 off the $20 list price. The average price for this game since released is $9.83. The game first became 50% off on Dec 19, 2013 at Green Man Gaming. Lowest historic price was $3.75 on Dec 24, 2014 at Green Man Gaming. Season Pass of Arkham Origins is only $7.50, currently the newest lowest price. This will net you the upcoming recently announced new story DLC featuring Mr. Freeze. Let's see how this one pans out vs the best-ever Mr. Freeze via Arnold. Now only $8 (vs MSRP of $20), Arkham Origin Season Pass is on sale during GMG's Winter Sale, making it the lowest ever price we've spotted. Get extra skin packs plus extra content via an additional upcoming story DLC. New low on the Batman Arkham Origins Season Pass. Today GMG dropped the price $10 (50%) instantly AND there's a 20% off coupon for extra savings. Lowest price yet by $6. Arkham Origins Season Pass has a 25% off coupon at GMG. Includes a ton of new skin packs and a some extra content DLCs. Elsewhere $20. The average price for this game since released is $8.35. The game first became 50% off on Aug 8, 2016 at Fanatical. Lowest historic price was $3.99 on Jun 13, 2018 at Fanatical. On Steam right now both Batman Arkham Origins and Blackgate Deluxe are $20 each, but put the games together at Fanatical and it's only $3.99. New historic low price. Hot you may need to jump on immediately to get. The Batman Arkham Origins Complete Pack is down to $4.99 at Bundle Stars. New low by $4 and available for only 24 hours. After about 2 hours more than 50% of the keys have been sold, so it'll probably die shortly. New low by about a buck today on the Batman Arkham Origins Complete Pack at Bundle Stars after coupon. Beyond the Arkham Origins base game you also get the Season Pass, Black Mask Challenge DLC, and the two Online Supply Drop DLCs. Batman: Arkham City will be released in October 2011. Like its predecessor Batman: Arkham Asylum, this game is an open-world action game that used stealth and predator tactics as elements to its gameplay. This sequel now features upped weapons and equips, new abilities, new puzzles, and ofcourse, new villains. Pre-Order Batman: Arkham City for Xbox 360 or PlayStation 3 from Amazon and receive a $10 promotional credit toward the purchase of items shipped and sold by Amazon.com (certain exclusions apply, including Kindle books, MP3s, and video rentals and downloads). 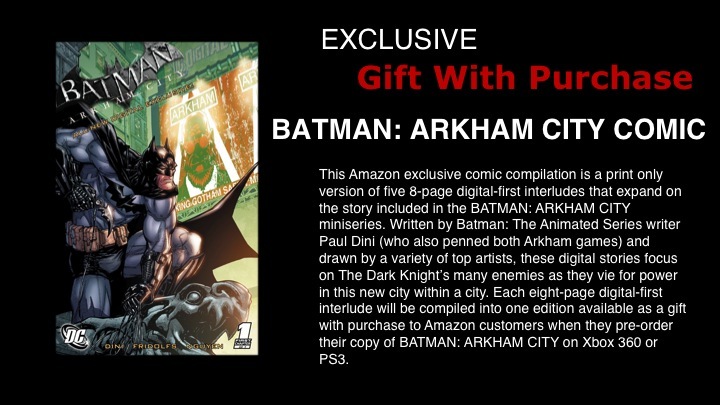 Also get the Amazon.com exclusive Batman: Arkham City Comic included in your shipment. The $10 promotional credit will be added directly to your Amazon.com account within two days after your order ships.